Figure 1. 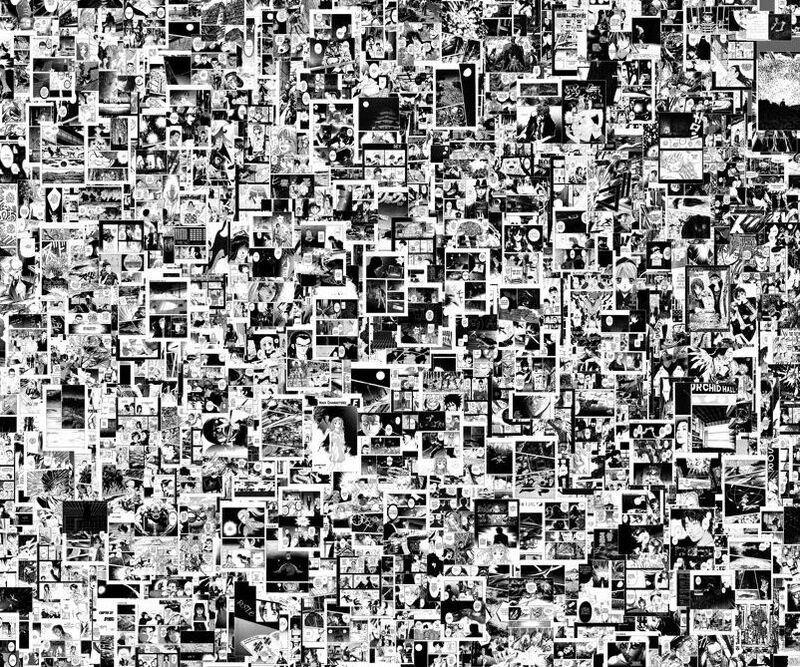 This visualization shows 1,074,790 unique pages from 883 distinct manga series from Japan, Korea and China. The series include both very popular long-running titles such as Naruto and One Piece and also many short-lived titles. The visualization maps the pages the pages according to some of their visual characteristics that were measured automatically on supercomputers at the U.S. National Department of Energy Research Center using custom software developed by Software Studies Initiative. (X-axis: standard deviation. Y-axis: entropy.) See a full size image with an extended description on the project's Flickr page. Close-up detail of Figure 1. See the full size image on Flickr. Figure 3. The visualization shows 800 consecutive pages from "Anatolia Story". Detail. See the full size image on Flickr. Close-up detail of Figure 3. See the full size image on Flickr. Jeremy Douglass, Lev Manovich, Tara Zepel. 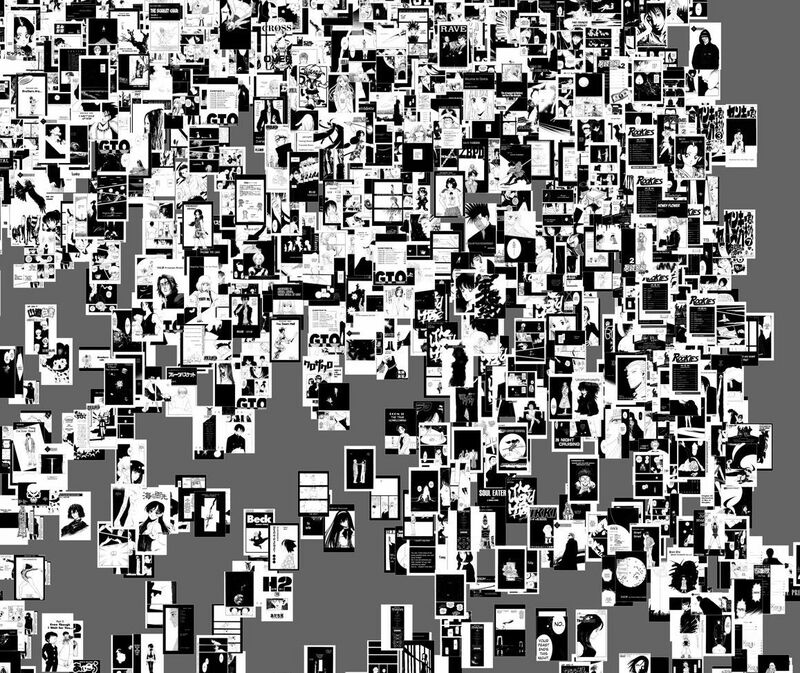 "How to Compare One Million Images?" in David Berry, ed., Understanding Digital Humanities (Palgrave, 2012). "The humanities with some heavy iron...compared to other scholarly attempts to analyze Japanese comics — well, *gasp, choke, Good Lord! * Lookah that thing! It’s like some terrifying splash panel from vintage EC comics." Bruce Sterling, a blog post about our Manga visualization, November 14, 2010, wired.com. In the Fall 2009, we downloaded 883 Manga series containing 1,074,790 unique pages from this site. We then used our custom software system running on a supercomputer at National Department of Energy Research Center (NERSC) to analyze visual features of these pages (funded by Humanities High Performance Award from NEH Digital Humanities Office.) To match the scale of the data, we are using 287 megapixel The Highly Interactive Parallelized Display Space (HIPerSpace) with a custom software for interactive exploration of large image sets developed between our lab (softwarestudies.com) and Gravity lab at Calit2. 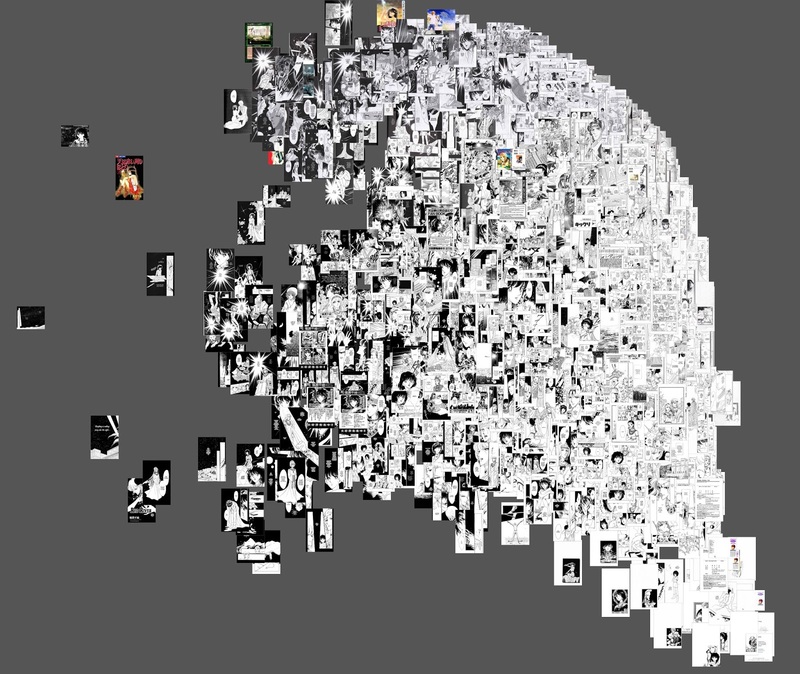 Visualization (Figure 3) shows our complete data set - 1 million Manga pages organized in 2D space according to their visual characteristics. The pages in the bottom part of the visualization are the most graphic (they have the least amount of detail). The pages in the upper right have lots of detail and texture. The pages with the highest contrast are on the right, while pages with the least contrast are on the left. In between these four extremes, we find every possible stylistic variation. Data: 883 Manga series from the scanlation site OneManga.com. Total number of pages: 1,074,790. Mapping X axis: A mean of standard deviation of pixels’ grayscale values in a page. 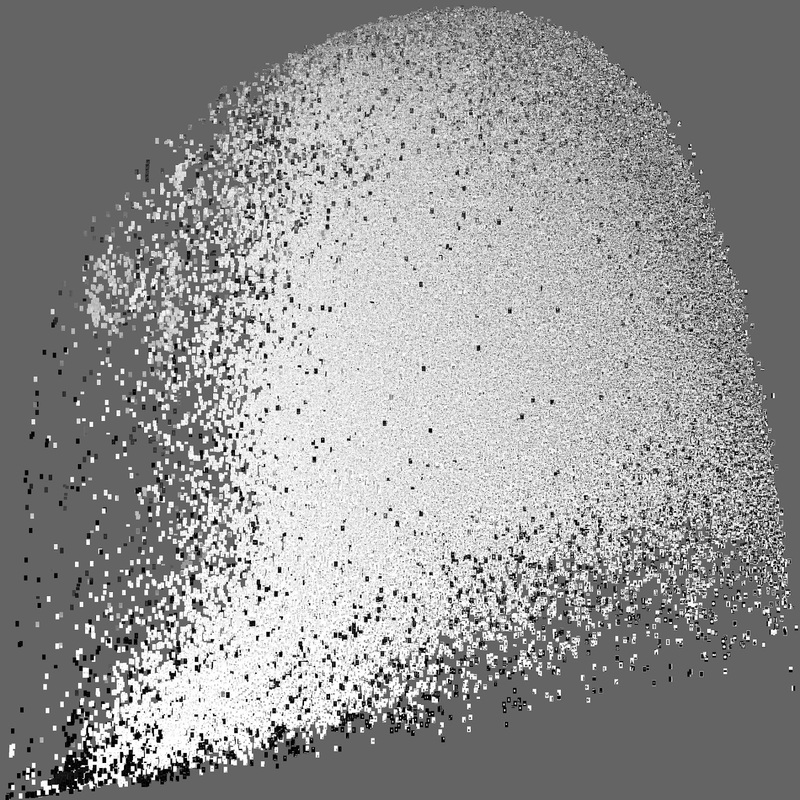 Y axis: A mean of entropy measured over all pixels’ grayscale values in a page. What do we learn from this visualization? It suggests that the very concept of style as it is normally employed becomes problematic then we start analyzing large cultural data sets. The concept assumes that we can partition a set of works into a small number of discrete categories. However, if we find a very large number of variations with very small differences between them (such as in this case of 1 million Manga pages), it is no longer possible to talk about "style" of these works. Instead, it is better to use visualization and/or mathematical models to describe the space of possible and realized variations. What about single manga titles? Is it meaningful to talk about a title's style? As we found out, often even a short title has such graphic variability that we also can't use "style" concept. Here is an example of such title ("Anatolia Story"). 879 pages are organized by brightness mean (X) and entropy (Y) (Figure 4). 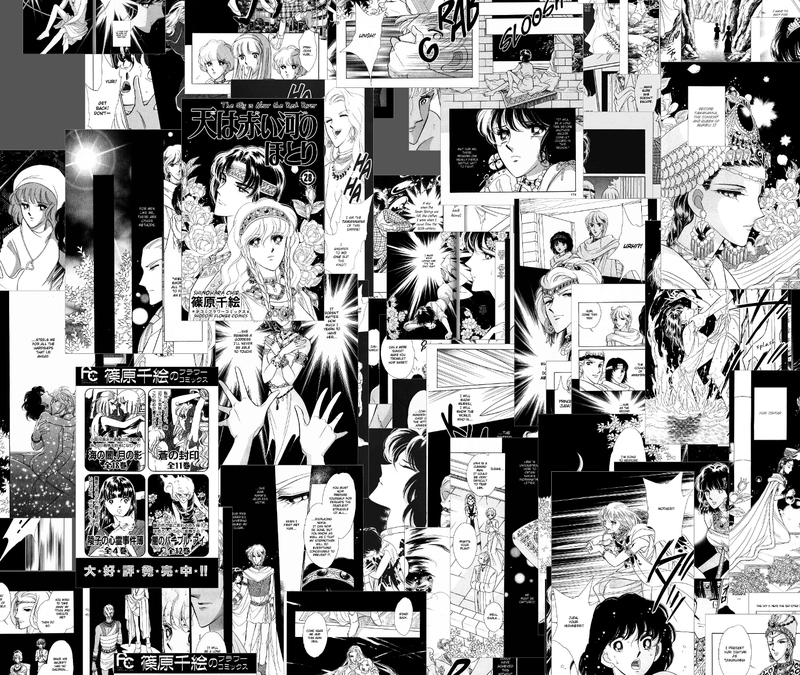 In these examples, manga pages are organized according to particular visual features. Taking into account other features and also higher-order attributes (content, composition, manga's visual conventions for rendering characters, their faces, backgrounds, etc.) may reveal the presence of distinct stylistic styles in the one million pages sample, and also show more stylistic coherence in individual manga titles. We are hoping to investigate these questions in near future. Daniel H. Pink. Japan, Ink: Inside the Manga Industrial Complex, Wired 10.22.07.